About ServicesEcommerceAd ManagementPortfolioget a quote! 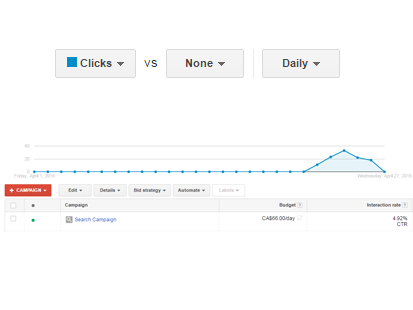 With a carefully implemented AdWords management campaign, even the toughest of industries to compete in can see impactful results. We took Workers Comp Wisconsin's existing website, made a couple of minor modifications to the home page and researched a keyword strategy that produced a hugely positive impact on their lead generation. Complete web marketing services built for the busy business owner. We work with clients who have a typical budget of $1500/month or more. The days of not knowing whether your website is making you money are over. We’ve removed confusing setup processes, technical dashboards, and outdated software from our design process so you can start generating leads as soon as your site is launched. We’ve even made it easy for you to manage and edit your own website with minimal training. Many agencies force clients’ websites into pre-existing formats and site-structures. They use out-dated templates and rigid workflows to create something that doesn’t fit the client they are working with. Greater Galaxy improves this process by creating something unique for every client, and using a workflow that almost automates the development process. By staying current with technology, we’re able to focus on creating something beautiful for your business that your customers will love to interact with. Already have a designer? We specialize in working with graphic designers to make your website a reality. We measure our success in how little time we spend coding. We use the most modern design programs and development languages to break your website or application down into smaller pieces and use those smaller pieces to create a story. We let you spend your time running your business and spend less time worrying about when we deploy your project. Online advertising is a key strategy to bringing in new leads for your business. Unlike other agencies who focus on vanity metrics like cost per click or number of views, we dig in deep and look for key performance indicators like cost per lead and cost per acquisition. These figures help us build better reporting for you, and give you a better idea of how we’re helping your business growth. We turn the table by creating comprehensive lead funnels, and combining them with aggressive content creation, social media and paid media strategies. It’s all about a return on investment. Getting found consistently online is a massive game changer for your bottom line. We run campaigns that capture interest, inform your visitors and drive contextually relevant search results right to Google so you show up first. Consecutive month over month improvements across two quarters since taking over management of this account. 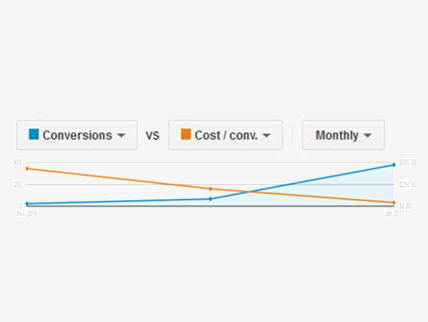 60% reduction of CPL (cost per lead) halfway into the fourth month of management of this account. The lead volume more than doubled. 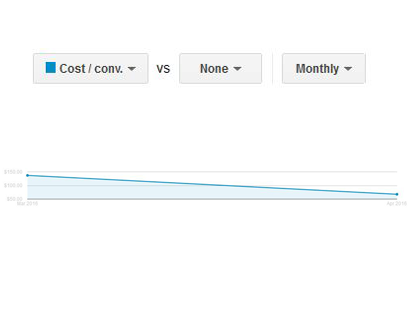 Consistent month over month decrease in CPL (cost per lead) since taking over management of this account. Lead volume has been trending positively as well. The lead volume increased by 1470% and the CPL dropped by 90% within 60 days of taking over the management of this account. Since we began managing this campaign in January there has been a significant, consistent drop in CPA. In addition the lead count has progressively increased and both metrics are at a historic low and high. 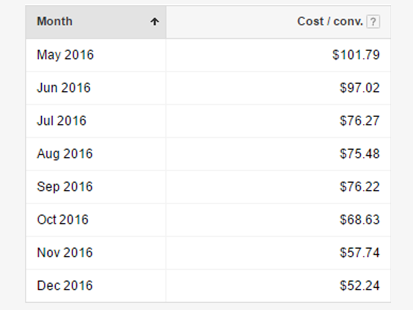 We took on this account in June, marking the beginning of consistent, month-over-month decreases in CPL (cost per lead). This was a brand new account that we launched in August of 2016. 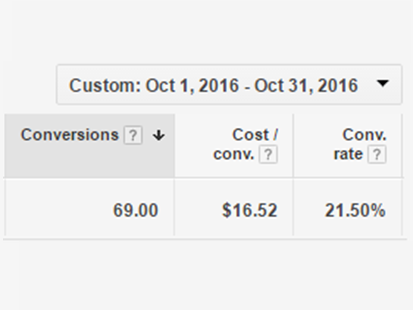 Within 90 days our conversion ratio was over 20% generating leads for less than $17. This was an existing account that we took on in October. 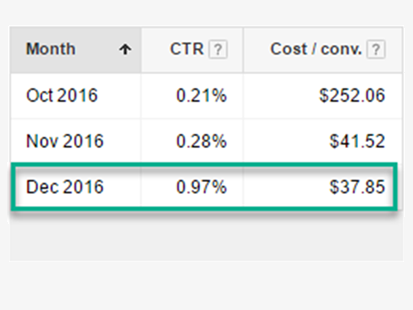 By December the CPC (cost per click) dropped by 85% and the CTR (click through rate) had increased by nearly 400%. 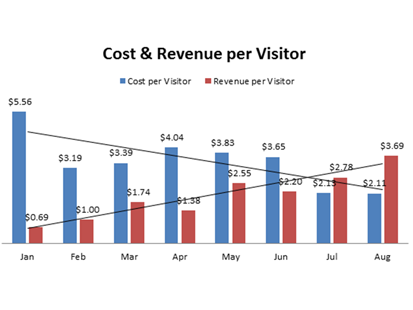 Since taking over management in June there has been a 67% increase in revenue per visitor and a 43% drop in cost per visitor. This account was launched in September. 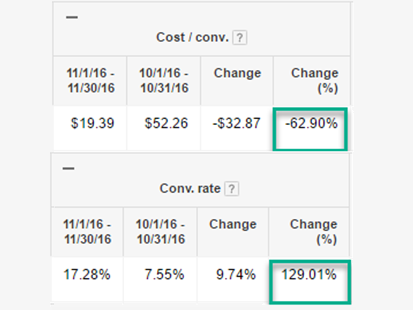 Within 30 days we had a 10% conversion ration and $52 leads. 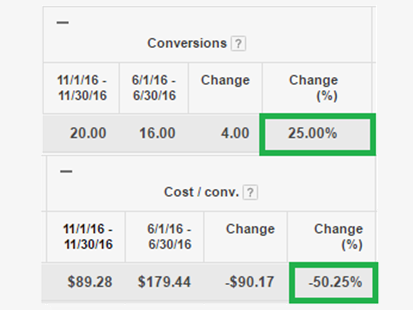 Within 60 days our conversion ratio was over 17% and our leads under $20. We took over this account in early January (second dot). 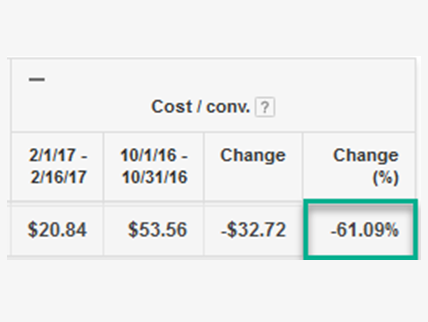 By the end of the month the leads doubled and the CPA dropped by 50%. This trend continued in the second with marked increases in leads and notable decreases in costs. 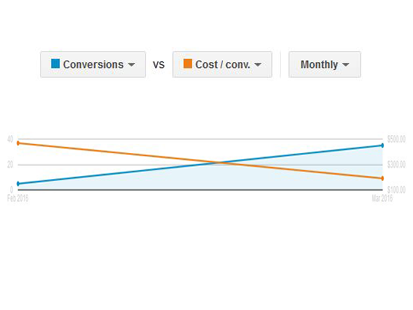 This was a campaign we built, which was yielding a 5% CTR (click through ratio) within one week, before any optimization. This does not include any branded terms. Anyone remotely familiar with paid search knows this was a very well built campaign. 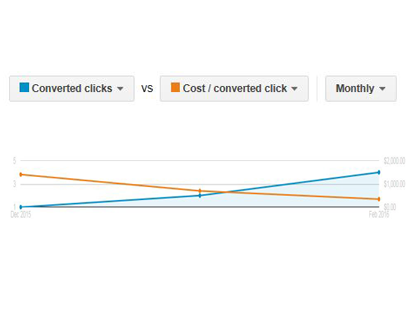 After 6 months of optimization this advertiser's lead cost had been cut in half. 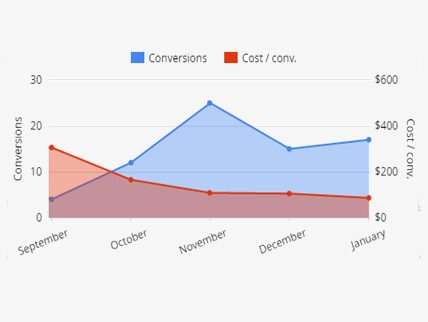 Though spending over 30% less, they were getting 25% more leads.